First to a million wins! The MONOPOLY Millionaire game is all about making a million dollars fast! Race around the board making a fortune, and live like a millionaire as you go! Plus, you get to upgrade your game mover to match your millionaire lifestyle when you pass GO. With each upgrade, the rewards are greater…but so are the risks! Live like a millionaire with MONOPOLY! Diamonds! Luxury limos! Movie premieres! They’re just part of everyday life in the MONOPOLY Millionaire game. You’ll love raking in the cash and racing to make a million first! Look out for the Fortune cards that let you shake up the game by zooming ahead or by taking bonus houses for free! Plus, with millionaire properties like Paradise Island and Party Plaza, this version of the classic game will have you living it up in the fast lane! Upgrade your lifestyle along the way! In the MONOPOLY Millionaire game you can rise to the top of the rich list and upgrade your lifestyle as you go! Swap your rowboat game mover for a luxury super yacht and make a million in style. Private jets, big business deals! Experience it all with Millionaire Lifestyle cards. Experience the thrills of life as a millionaire! First to a million wins! 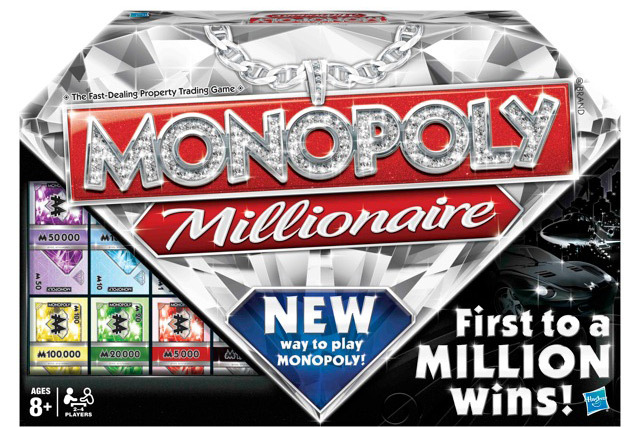 In the MONOPOLY Millionaire game, you need to make a million first to win! Upgrade your game mover to experience the millionaire high life as you play. Fortune cards get you into the game faster. Collect luxury properties and live it up with Millionaire Lifestyle cards. First to a million wins!